In the 1960s, JPL workers used teletypes to print out information for the Mariner 2 space probe, the world's first successful interplanetary spacecraft. For millions of Americans, 1963 began with the New Year's Day Tournament of Roses Parade broadcast from Pasadena, California, led by Grand Marshall Dr. William Pickering, the Jet Propulsion Laboratory's (JPL) director. Pickering was followed by a float honoring JPL's Mariner 2 space probe. Their prominent positions in the parade reflected the success of Mariner 2, the first spacecraft to encounter another planet, Venus, just 1 month earlier in December 1962. That success laid the groundwork for 40 more years of planetary exploration, from the 1960s manned lunar missions and the 1970s Mars Viking missions, to the Mars Odyssey mission's discovery of enormous subsurface frozen water deposits in May 2002. Since the initial success in 1962, JPL spacecraft have visited every planet in our solar system, with the exception of Pluto. The laboratory also manages the worldwide Deep Space Network, which communicates with spacecraft and conducts research from its complexes in California's Mojave Desert, Spain, and Australia. With every new space probe and discovery comes technology that leads to products with practical applications for industrial and commercial use on Earth. JPL's Commercial Technology Program, established in 1963 as the Office of Industrial Applications, was created to manage such developments. Since the program's inception, more than 200 U.S. companies have taken advantage of JPL's innovations. Some of the most significant technological contributions have been in communications, digital imaging, miniaturization, remote sensing, and robotics. From exploring the birth of the universe to mapping the interior of the human body, JPL instruments have achieved new breakthroughs. The Robot Assisted MicroSurgery workstation enables new procedures for the brain, eye, ear, nose, throat, face, and hand. The device uses computer compensated motion control to dramatically reduce the effects of operator muscle tremor. JPL technology affects the lives of Americans every day. 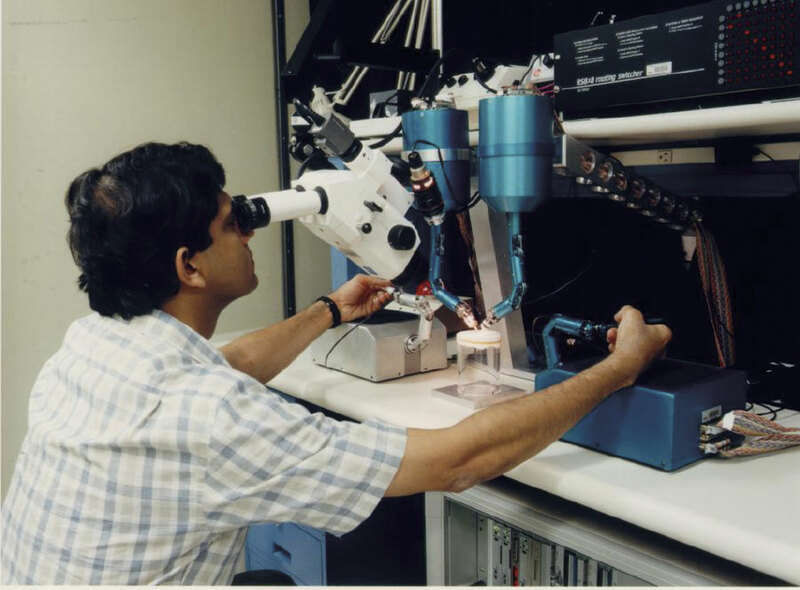 For example, the laboratory led the way in developing the capability to send and receive data within our solar system. This data transmission required a long-term series of technology developments of deep space antennas, precision timing systems, signal detection, and digital processing. Today, these technologies are widely used for wireless communication products. 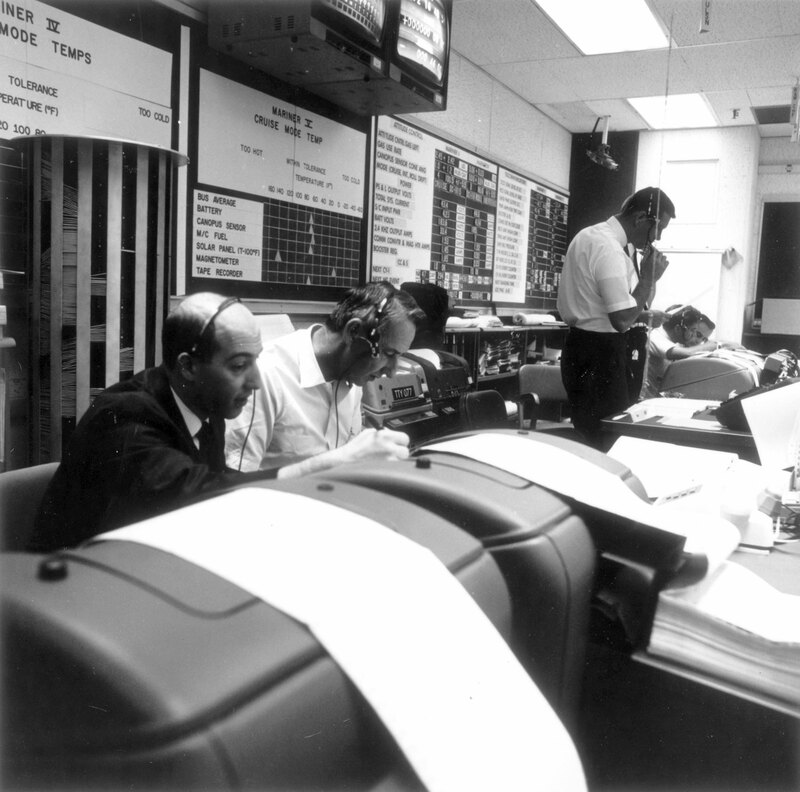 Digital image processing was pioneered at JPL in the late 1960s, when analog signals from the Ranger spacecraft were converted to digital images with computer enhancement. The Ranger series was designed solely to take high-quality pictures of the Moon and transmit them back to Earth in real time. The images were used for scientific study, as well as for selecting landing sites for the Apollo Moon missions. The Mariner 4 probe, visiting Mars in 1965, was the first spacecraft to send digital images back to Earth. Today, digital imaging has a wide range of applications, with particular emphasis in medicine. Well-known uses include Computed Aided Tomography (CAT) scanning and ultrasounds. Miniaturization is a crucial part of JPL's research and development efforts. Creation of ever smaller devices not only helps NASA miniaturize all aspects of its space systems, making space exploration more manageable and affordable, but also yields significant technology advances. JPL engineers have developed powerful sensors as small as a coin and computer chips no bigger than the period that ends this sentence. Doctors and patients already benefit from some of these technologies used in surgery and non-invasive procedures. A miniature sensor that images in the infrared and locates cancerous tumors is in clinical trials for non-invasive mammography. OmniCorder Technologies, Inc., has licensed JPL's Quantum Well Infrared Photodetector camera technology for detection of breast and skin cancer. The sensor, which helped JPL locate hot spots during fires and observe volcanoes, may potentially benefit other surgical or therapeutic procedures that require rapid and precise monitoring of blood perfusion changes. A landmark discovery by JPL's Mars Odyssey spacecraft revealed frozen water on the Red Planet. JPL engineers assisted in developing a tiny camera chip placed in a pill. Once ingested, this camera-pill photographs the inside of the digestive system and provides doctors with enhanced diagnostic information. The pill's Active Pixel Sensor expands on charge coupled device (CCD) technology (high-resolution imaging that revolutionized the field of astronomy and is now found on many scientific space vehicles, such as the Hubble Space Telescope) by consolidating functions and reading images more efficiently. The sensor requires one-hundredth the power of a CCD system and is less susceptible to radiation damage in space. Photobit Corporation, a spin-off company from JPL, obtained licensing rights to the technology and continues to develop and market it for use in camcorders and digital cameras. Miniaturization is not the only way JPL technology has contributed to medical advances. Building on established NASA technology in telerobotics, JPL collaborated with MicroDexterity Systems, Inc., to develop a new robotic microsurgery device for delicate surgeries. Designed in cooperation with leading microsurgeons, this Robot Assisted MicroSurgery workstation, or robot arm, will enable new procedures for the brain, eye, ear, nose, throat, face, and hand.Another significant contribution from JPL is in the remote sensing field. JPL scientists and engineers have turned that knowledge Earthward to learn more about our own planet. In 1997, JPL gave the world an early warning of the El Niño phenomenon, saving thousands of lives and millions of dollars worth of property. Using the Global Positioning System (GPS) and altimeter data received from the JPL-managed Topex/Poseidon satellite, JPL scientists measured the height of the ocean and predicted the season of storms brought on by El Niño. GPS technology also monitors tiny slips along fault lines, and their strain in Southern California. Understanding this seismic activity will lead to better earthquake preparedness. Last year, farmers put a new GPS system to the test. NavCom Technology Inc., a division of the John Deere Company, licensed the technology and equipped tractors with receivers providing instant location information. The GPS allows farmers to navigate fields at night and during poor visibility. With soil sensors and other monitors, they can precisely map where fields may need more water, fertilizer, or weed control, saving both time and money. In the future, "bulldozer" rovers and other robotic explorers may be used to look for life and build a Mars outpost to sustain a human presence. Other advances from the exploration of Mars will be plentiful. 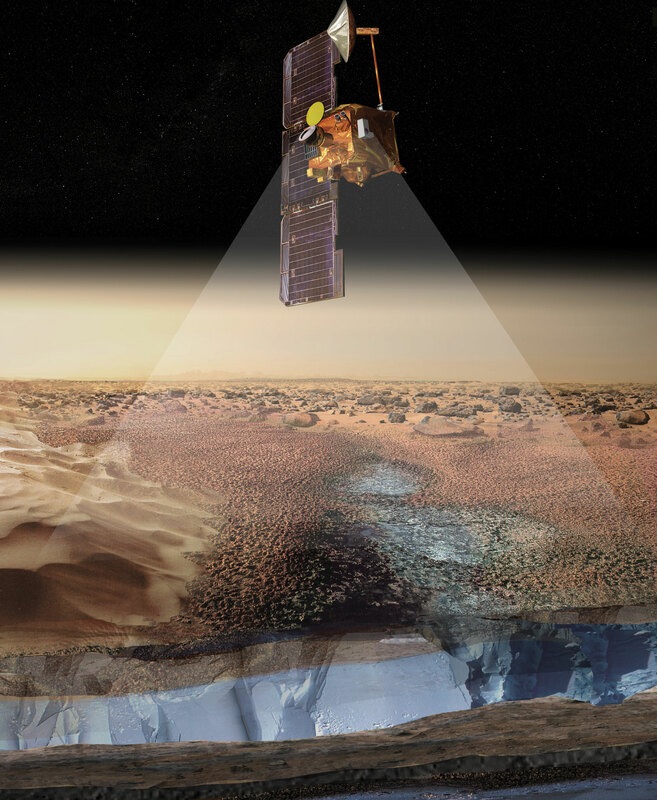 In another sensing application, a landmark discovery by JPL's Mars Odyssey spacecraft revealed frozen water on the Red Planet. This year, scientists were surprised to find enormous quantities of buried ice lying just under the surface of Marsenough frozen water to fill Lake Michigan twice. 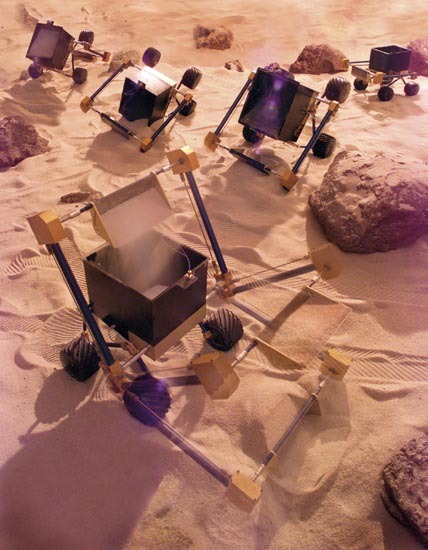 The detection technologies used on Odyssey may have applications for remote detection of materials on Earth. Future Mars explorers may include a giant "beach ball" rover rolling along the surface of the planet. Called the "tumbleweed rover," the lightweight, two-story-tall ball may be used to traverse the tough, sloping Martian terrain. Other rovers may literally hang "on the edge" to give scientists a good look at the planet's nooks and crannies. The new "cliff-bot" rover can do just that. Artificial intelligence software drives a team of rovers able to set up camp and work independently. "Bulldozing" rovers may scoop up the Martian soil. Basic research on these robotic explorers may support future Mars missions to look for life or to sustain a human presence and lead to new innovations in commercial technology.